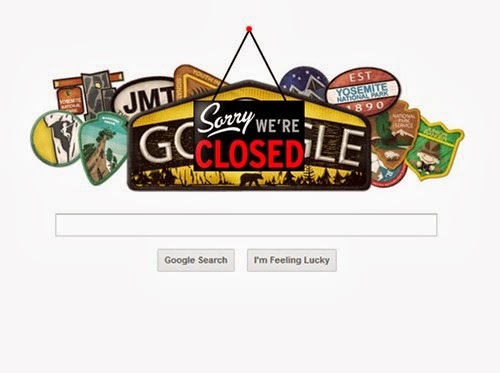 Did anyone else see the irony of all the Federal parks closing due to the recent government shutdown on the anniversary of the founding of the first one? I started writing a rant regarding the Federal Government shutdown, but was distracted by other things and it was over before I finished my post. Then I decided to wait a while to see what would happen. I wanted to see what our Federal Government would do after the shutdown was over. Sadly they are doing exactly what I expected they would do to resolve our budget problems. Nothing. All the emergency meetings, all the press conferences, all the finger pointing and name calling by politicians regarding the debt crisis abruptly stopped when the debt ceiling was raise. Then it was business as usual, problem solved. Even though the problem is still there, and is growing bigger by the day. A good way to look at the problem we are in is to pretend the Federal Government is a family. A family that is spending more money than it makes. Over time luxuries mysteriously became necessities. Monthly bills increased, but income did not. Everyday items were put on a credit card with the thought of “I’ll pay it off next month,” even though they knew there would be the same amount of money to go round that month. Now while blaming their money problems on the poor economy, even though they made the same amount of money back when the economy was supposedly so good, they are closing in on the limit of their credit card. Family members are getting nervous and the ideas to resolve their debt problem start. And so they go on, refusing to give up any of their “necessities” they have. A car for each member of the family, not to mention their own flat screen TV, smart phone, computer and tablet. It would be crazy to think a family could share one device, let alone do without them at all. So they make some extremely tough budget cuts. The wife only stops for a $5.00 Starbucks coffee on her way to work four days a week instead of five. The husband orders water instead of a Coke with his $7.00 lunch he buys every day. And other major, major sacrifices like that. But just when things look their worse, the family gets a letter from their credit card company that says their credit limit has been increased by $5,000. Problem solved. No they have a little breathing room and some time to figure out a budget that they can live on. One that allows them to pay down their debt, pay the bills and set aside some savings. All they got to do is come together and tighten their belts a little and cut down on the waste. Unfortunately we all know they will not do that and continue their poor spending habits. Just like our Federal Government. This problem hasn't been solve and is not going away. Eventually we will have to pay our debts instead of pushing the problem off to deal with later, hoping we will magically come into more money. Or in the government’s case; hoping we stay below the debt ceiling until someone else is in office. Then it’s someone else's problem.